Jessica McCaskill is to face Katie Taylor this week at York Hall in London 13th December 2017. This really is a very interesting transatlantic contest in women’s boxing, and will be the biggest fight of the year. 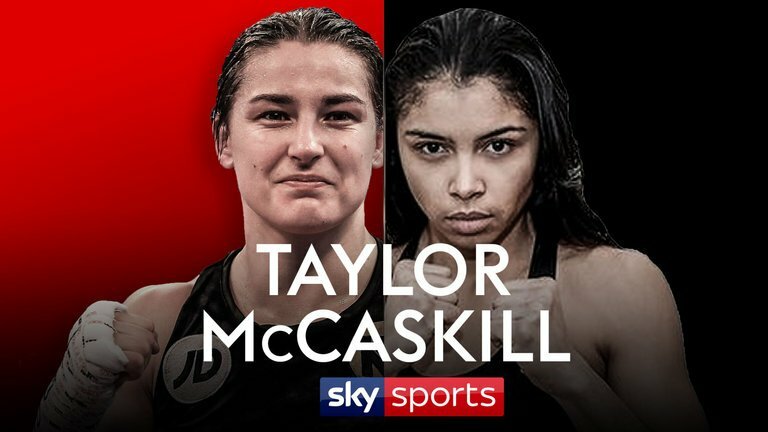 Katie Taylor is the pound for pound number one female fighter, and McCaskill is ready to take that scalp. McCaskill comes in with a record of 5-1-0, 3 KO’s in comparison to Taylor’s 7-0-0, 4 KO’s. McCaskill will be coming in as the underdog as Taylor won the gold medal at the London 2012 Olympics in the lightweight division. Taylor is the current WBA female lightweight champion. Jessica McCaskill and her coach Rick Ramos have been kind enough to tell us the latest in the camp during the run up to the fight. WV: How did you get into boxing?And tell me about your amateur background? I was raised in Southern Illinois, USA. My ethnicity is half African American and half Latina, and as I was growing up I played every sport except boxing.My education was completed at Southern Illinois University Edwardsville, in which I graduated with a Communications degree. My boxing journey began after college. In 2008 I began boxing purely for fitness, and in April of 2009, I had my first amateur bout.I boxed out of St Louis, and began to climb the amateur ranks winning the 2010 Golden Gloves award. WV: You are from St. Louis and now reside in Chicago. Can you tell us how this came about? Was it to pursue your career as a boxer? I am now representing Chicago, Illinois, and hold two additional Golden Glove Championship belts from 2014 and 2015. With my amateur career behind me I signed with Rick Ramos Boxing in August of 2015 for him to manage my career. And I now hold a professional record of of 5-1-0, 3 KO’s. WV: Rick Ramos how did you discover Jessica McCaskill? I was always a be believer in female boxing and I wanted to be in on the ground level. So, I decided to host anall-female amateur boxing event in Chicago. Jessica saw the flyeron social media and contacted me. Jessica had just moved to Chicago from St. Louis. Jessica came to my gym and asked me if she could fight on my show. I asked her if she had a trainer and she said no, and that was the beginning of 17-1 amateur record together and then 5-1 in the pro’s. WV: So, Rick now down to the nitty-gritty. How did negotiations go with Eddie Hearn go on the Katie Taylor fight? To begin with his offer was a little low, I counted and then put the ball figure back in his park. WV: Rick, anything specifically you would like to share with the readers? I would like to thank everyone who has supported myself, my gym and of course Jessica’s career. Team McCaskill has worked hard to get the fight with Katie Taylor. This is a fight that we have been waiting for! WV: Rick, is Jessica McCaskill ready to take Katie Taylor’s crown? Yes, Jessica is a very hard puncher. Katie took this fight too fast. Katie agreed to fight us immediately after her last fight. She had stitches in her face still. I don’t think she got a full training camp and I think they are underestimating how hard of a puncher Jessica is. Not a lot of females want to fight Katie, let alone in her back yard, so we stepped up. Jessica is well rested and ready for a war!